The Ruthless Organization Against Citizen Heroes. Our primary goal is to be a counter balancing force against the Superheroes of the world who's goodwill and penchant for spreading hope has gone on unchecked for far too long. Where they exist to help and motivate society, we exist to help and motivate ourselves and to bring society under our boot! But! It can not be done alone! Only through working together may we achieve our goal of creating mayhem and chaos across the globe, and in the process CRUSH the costumed heroes of the planet! Then, once mayhem and chaos have been created we will use our superior intellect and braun to forge a new world order under the flag of R.O.A.C.H. Visit our Recruitment page to learn more and to sign up. 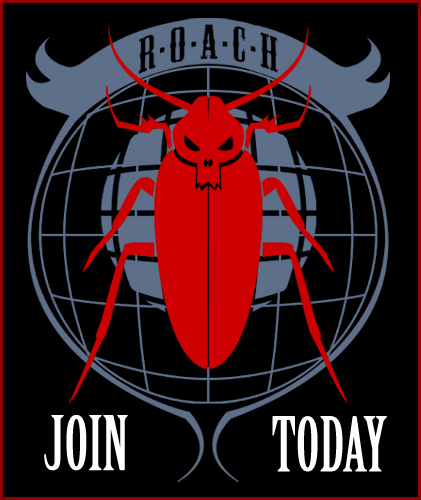 And begin to show your allegiance to R.O.A.C.H. by donning the first (of many) official 'Flow-Form Exo-Skeletons' (tee shirts) available on the Accoutrements page. Keep in constant contact with us, and be continuously updated by clicking the links to the right. Spread the word. ROACH is here.